The second in a series of three blogs looking at themes arising from ‘reading strategies’ projects commissioned by LRLR under the Students as Change Agents (SACA) programme. 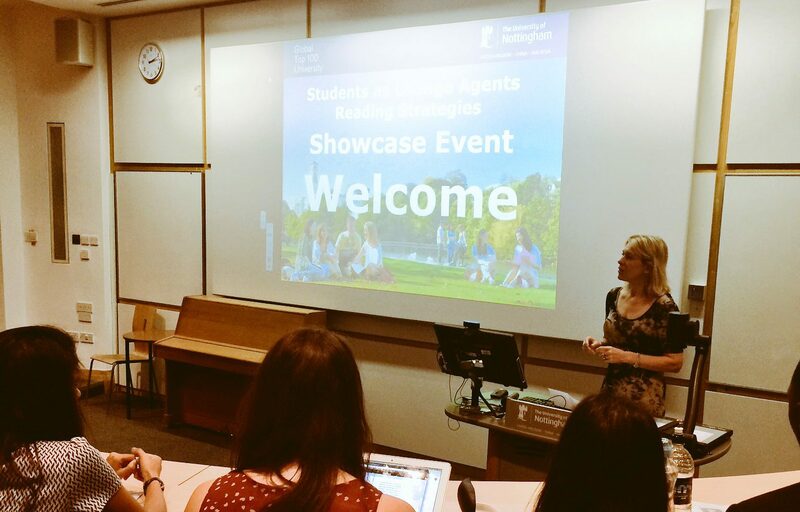 On Thursday 15 June an invited audience – including Professor Sarah O’Hara (PVC for Education and the Student Experience) and Beth Massey (outgoing Students’ Union Education Officer) – assembled at the Arts Centre, University Park, for a ‘Reading strategies showcase’. Students teams from Psychology, English, Politics and Engineering presented their findings from projects commissioned last year by Libraries, Research and Learning Resources (LRLR) to consider discipline specific challenges and solutions associated with course reading. A key focus of all the projects was to understand the challenges around reading from the students’ perspective. We were all impressed by the wealth of data and information the student team from Politics and International Relations (PIR) collated. In addition to a comprehensive survey of students, the team interviewed academics and staff from LRLR. Drawing conclusions from such a variety of information is always challenging. However, as well as identifying a series of key reading strategies challenges facing PIR students, the team also produced a resource to address some of the underlying issues. 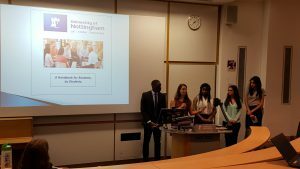 Politics project delivers NUsearch guide “for students, by students”. One in four of the survey respondents felt that they were not using NUsearch as well as they could be. Our libraries contain over 1 million print books and journals, and over 300,000 ebooks and 30,000 ejournals. With such a massive array of resources to explore it is easy to see both why students may feel they are not searching our collections as well as they could be, but also the massive opportunity that improving their confidence and skills in the use of NUsearch presents. Almost half of the survey respondents said they had struggled to find resources in the library. Furthermore, 40% of the respondents were not aware of the services provided to help them access books and resources that we don’t stock in our collections. Services are only useful if people know about them and how to use them. How can LRLR ensure that all our students are aware of and can benefit from our interlibrary loan scheme, the SCONUL access scheme, and our More Books campaign? The PIR team recognised that improvements to reading strategies will be most successful if they are co-created by both students and academics. Whereas the survey identified where students felt they faced the greatest challenges, interviews with academics provided an alternative perspective. Unlike the practical concerns with search techniques identified by the students, the academics interviewed also felt that improving students’ skills in referencing and source appraisal would be beneficial. Taking on board all of these insights, the group produced a handbook “for students, by students”. Packed full of top tips and practical examples, the handbook aims to help Politics and International Relations students search for, find and reference reliable and up-to-date reading resources. The only question, as expressed by Professor Sarah O’Hara, was why we couldn’t roll out this fantastic resource across the Faculty of Social Science, or even the University! Professor Sarah Speight, academic lead for the Transforming Teaching Programme, closed the event by observing that we all have a lot of assumptions about student reading strategies, but we need to be more explicit in the help and direction we provide. Sarah reinforced that, far from spoon-feeding students, the projects have highlighted a need to better equip them with the strategies, resources and support they need to succeed in their studies. SACA is open to all students, across all years and campuses. Through projects, SACA enables students to make a real impact on teaching and learning. As well as the opportunity to make a positive change that enhances the student experience, SACA students also develop valuable skills for employability, such as project management, communication and problem-solving. The University’s recent success in attaining Gold status in the new Teaching Excellence Framework (TEF) was, in part, thanks to SACA which received special mention from the TEF awarding panel. If you are interested in becoming involved in the Students as Change Agents Programme, see their website for more information. You can also email them directly at changeagents@nottingham.ac.uk or follow them on Twitter @UoNChangeAgents.